Happy Wednesday crafty friends! Rhonda here today to host the blog for you. 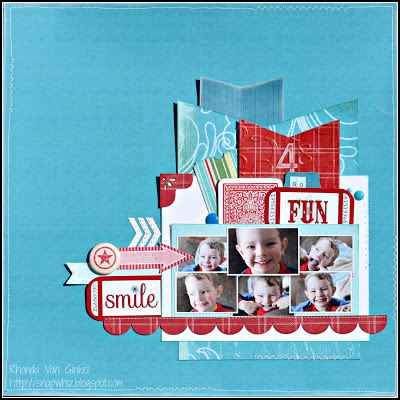 Today I have a page to share with you that I created using pieces from the May Club Q - Page Layouts Kit. The colors in these kits are so vibrant and totally fun! The ticket shapes and sentiments were perfect for these photos that I took of our youngest one silly morning. He was hamming it up for the camera and I thought it would be great to do a collage of his many faces. It's a nice way to tell a silly story sometimes with either a photo strip or a collage. I embossed one of my layers and sanded the number 4 for focus. Do you like the three little chevron arrows? I took a scrap piece of my chevron pattern paper that was about 1" wide and trimmed three of them. Don't get too fussy about cutting them perfectly, part of the charm is that they are handmade. The "fishtail" layers were all hand cut to a shallow inverted point as well. I used our Coconut white PowderPuff Chalk Ink around the darker blue "fishtail" layer and the base background blue card stock. The slight touch of Coal Miner PowderPuff Chalk Ink on my mini card really helps the shape pop. 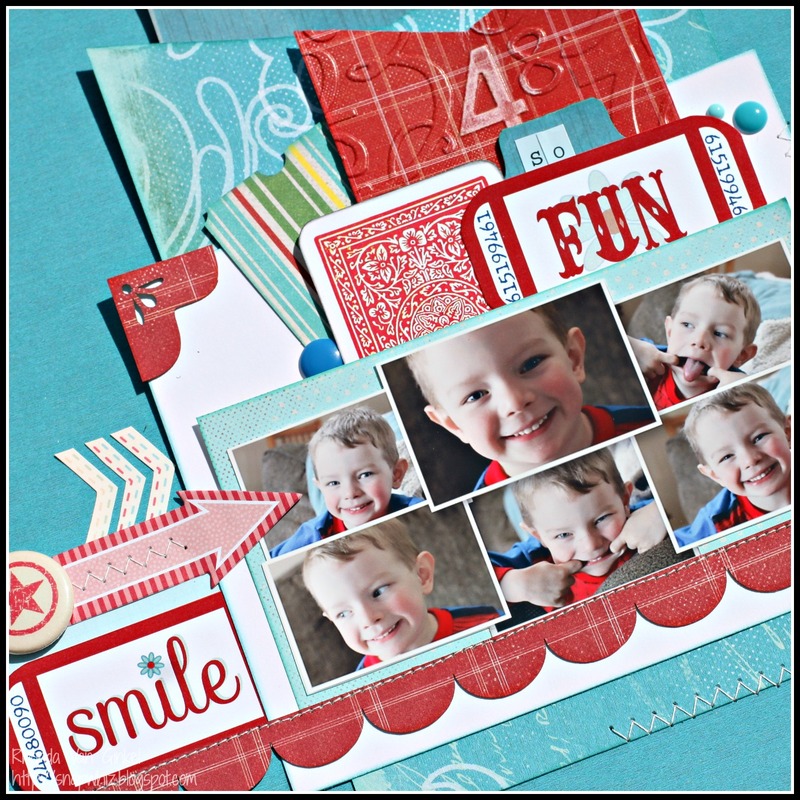 The ticket shapes, scalloped red border and pretty photo corner are just some of the die cuts included in the kit. They make designing your pages so quick and easy! Tin Pin - October Afternoon, Red Arrow and Blue Fishtail by K and Company, Enamel Dots - MME, Number Collage Embossing Folder - Cuttlebug, Mini Alpha - MLS, Tab Punch - Stampin Up, Sizzix Big Shot, Sewing Machine and Thread. Thanks so much for stopping on over to visit the blog with us today! Really fun page really love the die cuts. Absoutely adorable. love your project, colours are bright and cheerful and those photos are too cute, love all his poses! I love Q Q'S techniques and videos...they rock!! LOVE it!!! Already pinned it to my QQ Pinterest board! Thanks for sharing.. Very fun LO and he is a cutie! Darling layout. I love seeing the techniques and tutorials. LOVE this layout!! I really love the way you embossed and sanded the four... great touch! !